On view in the Thinkspace office area are works by Terry Arena in Swarm. 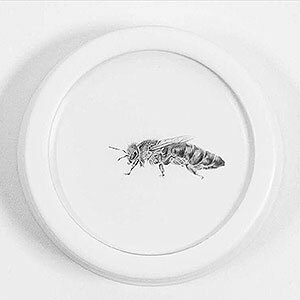 Working on gessoed object surfaces, Arena creates beautifully detailed and delicate renderings of bees in precisely drawn graphite. Her monochromatic pieces are minimal compositions surrounded by negative space, like specimens in petri dishes. Impactful in their precision and sparsity, these intimate examinations of the endangered insect so essential to our survival and the propagation of plant and wildlife, are quiet loud. Such a small and seemingly negligible creature is vastly misunderstood and much more crucial to the longevity of life on our planet than most know. Arena creates her renderings on concentric surfaces, closely grouped together as small systems – little ecosystems unto themselves – to invoke both the idea of interconnectivity and the impending destabilization and imbalance of nature’s fragile symbiosis.